The sprawling Spanish capital of Madrid boasts a buzzing cultural scene, lively nightlife and eclectic food influenced by flavours from all over the country. As one of the biggest cities in Europe, you’ll find this important industrial metropolis is packed full of things to see and do. Whether you love sport, shopping, art or anything in between, Madrid won’t disappoint. The city is the perfect starting point if you’re planning to explore Spain, with excellent road connections and some great destinations within easy driving distance. But there’s so much happening in the capital that you won’t want to leave until you’ve sampled all the highlights. Madrid became the capital of Spain in 1561, when it had a population of just 25,000. Today there are more than three million people living here, and the city’s importance in Spanish industry and culture remains unrivalled. Start your exploration of Madrid’s history at its central square, Plaza Mayor. Built in the 16th century, it has now fewer than 237 balconies that all look out onto a statue of King Felipe III on horseback. Once a site for bullfights and major public events, today the square is filled with restaurants and cafés. You can also admire one of the grandest buildings in the square, the Casa de la Panadería. This 18th century structure once housed the city’s main bakery, but today it’s home to the Tourist Information Centre. On the front you can see some impressive frescoes of mythological figures that date back to 1992, when Madrid was named European Capital of Culture. Not far from Plaza Mayor is one of the city’s other main squares, Puerta del Sol – Gate of the Sun. As the name suggests, this was once a gate at the very eastern edge of the city, but today it stands at its centre. 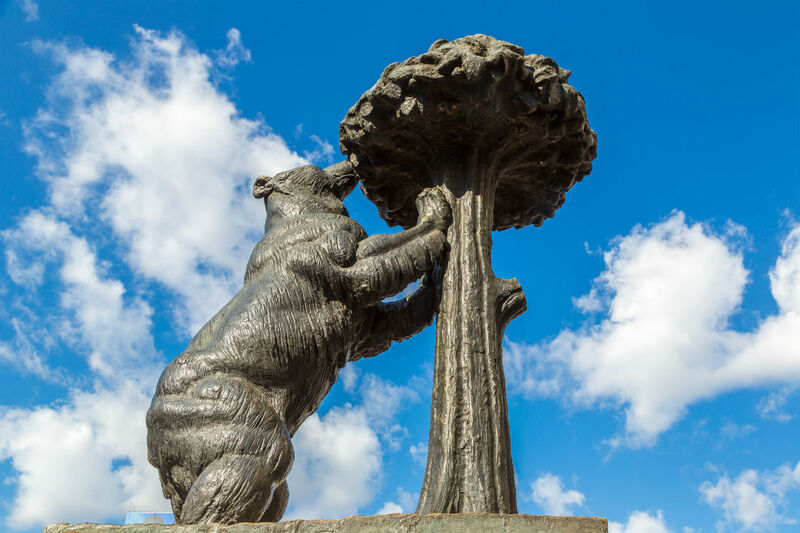 It’s here that you’ll find El Oso y el Madroño, the Bear and the Strawberry Tree, a sculpture that serves as the official symbol of Madrid. Made from stone and bronze and weighing around 20 tonnes, the statue has stood in the square since 1967 and represents the city’s coat of arms. 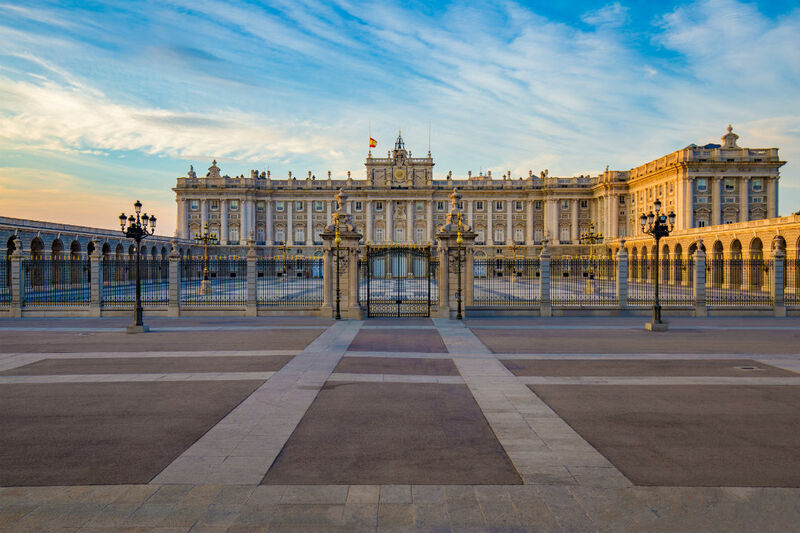 Another must-see building in Madrid is just a few hundred metres from Puerta del Sol – the Royal Palace. Built on the site of a ninth century Muslim fortress, the current building was erected in the 18th century after the original structure burnt down. This is the official residence of Spain’s royal family, although they actually live in another palace on the outskirts of the city. You can buy tickets to explore the palace and the Royal Armoury inside, which houses weapons and armour belonging to Spanish monarchs dating back to the 13th century. Next door to the palace is the Catedral de la Almudena, which stands on the site of the city’s first mosque. Construction of the cathedral was not completed until 1993 and the interior is spacious and modern, crafted in the Neo-Gothic style. Entry is free, but guests are invited to give a donation. It’s also possible to climb the cathedral tower, where you can enjoy excellent views of the city below. As well as its architectural gems, Madrid is also home to some world famous art galleries and museums. Check out the Art Triangle around the Paseo del Prado, made up of the Museo del Prado, the Reina Sofia and the Thyssen-Bornemisza. The Prado houses paintings and sculptures dating from the 12th to the 19th centuries, with highlights including works by Goya, Rubens and El Greco. Thyssen-Bornemisza, just a short walk away, connects the classical works of the Prado with the modern world represented by Reina Sofia. It contains paintings by Monet, Cézanne and Van Gogh, to name just a few. But for modern art lovers, the highlight comes at the Reina Sofia. It’s here that you can see Picasso’s Guernica, an enormous oil painting that tells the story of devastation caused by the bombing of the small Basque town in 1937. Many of the gallery’s other most famous works come from Spanish artists including Dalí, Miró and others. But Madrid isn’t all about art and history. If you’re keen to do some shopping during your stay, head to Gran Vía, the main tourist street that runs through the city. Here you’ll find jewellers and other traditional stores alongside a number of modern brands and international high street names. The city’s also home to a number of lively markets, and if you’re there on a Sunday it’s well worth checking out El Rastro, a flea market held near La Latina metro station. Here you can find clothing, jewellery and souvenirs, or head down the side streets to discover even more offerings among the antique shops. 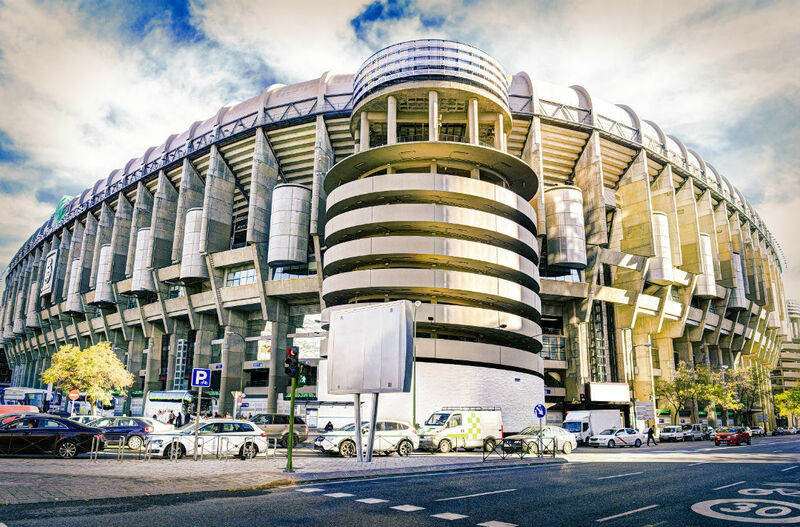 Meanwhile for sports fans, a visit to the Santiago Bernabéu stadium is a must. This is the home of Real Madrid, one of the world’s biggest soccer teams. The stadium is located just a short drive outside the city centre and if you don’t have tickets to see a match, you can pay for a tour which includes the dressing rooms, players’ tunnel and the presidential box, with panoramic views of the pitch. From hotels and B&Bs to apartments – when it comes to staying in the city, the sheer number of places can make it hard to pick just one. To help, we’ve taken a look at a few to start your search. For a luxurious stay in the heart of the city, take a look at the Gran Hotel Inglés. Located in the Barrio de Las Letras area, just a short walk from Puerta del Sol, this hotel boasts a stylish Art Deco design with a 1920s theme. There’s a spa offering beauty treatments and a gym, while in the evening you can head for a meal at the Lobo 8 restaurant or sample some tasty tapas in the lobby bar. Also in the city centre, not far from the Royal Palace and the Manzanares River, Barceló Torre de Madrid has comfortable, stylish rooms, some of which boast views of Gran Vía and the Plaza de España. This hotel also offers a gym and swimming pool, making it the perfect place to unwind after a busy day of sightseeing. If you’re planning to check out the bohemian neighbourhoods of Malasaña and Chueca during your stay, you might want to check out Urso Hotel and Spa. There’s a spa, gym and pool, along with a conservatory where you can enjoy a breakfast buffet before you head out for a day in the city. This location is also ideal for nightlife, with plenty of lively bars and restaurants nearby. As well as all the accommodation on offer, Madrid is the perfect destination for foodies thanks to its diverse array of culinary delights. The city is perhaps most famous for its tapas bars, with dishes that range from traditional Spanish to ultra-modern and plenty in between. Try Taberna La Catapa in the Retiro district of the city for an authentically Spanish experience, with choices including navajas a la plancha (razor clams) and rabo de toro (oxtail stew). It’s a popular choice, particularly with locals, so try to book a table in advance if you can. For modern and adventurous dishes, take a look at TriCiclo in the city’s literary quarter. Its dishes feature an eclectic mix of global influences, including India and South East Asia, and you can sample most of them in a small tapas size. There are several meat-free options on the menu, too. Or if you want a more classic meal, head to Sobrino de Botín. Recognised by the Guinness Book of World Records as the oldest restaurant in the world, it was founded in 1725 and is still going strong today. It’s a popular spot for tourists who want to sample traditional Spanish dishes, particularly its most famous dish cochinillo asado – roast suckling pig. it’s a longstanding favourite with visitors and locals alike. Madrid might be a huge and busy city but it features a surprising number of peaceful parks and green spaces. Perhaps the most popular is El Retiro, located near the city centre. First opened to the public in the 19th century, this spacious park is home to tree-lined walkways, incredible monuments and peaceful gardens. For a different way to spend your afternoon, hire a boat and head out onto the water. It’s the perfect way to take in the tranquillity of the area. El Retiro also contains one of Madrid’s most famous buildings, the Palacio de Cristal or Crystal Palace. Made almost entirely out of glass, it houses many beautiful plants and also hosts art exhibitions throughout the year. Head further out of the city centre along the River Manzanares, and you’ll find Madrid’s biggest park, Casa de Campo. The park can be accessed via the Teleférico, or cable car, which takes you 40 metres above the ground over a distance of around one and a half miles. There is an audio guide that will tell you all about the sights you can see from the cable car, including the Plaza de España, cathedral and the royal palace. You can head to the main area of the park to explore its zoo. Home to Giant Pandas, Giraffes and stunning American Bison’s among others. There’s an amusement park here for an afternoon of entertainment, as well as a boating lake and outdoor swimming pools. Back in the city centre next to the Prado Museum are the Royal Botanical Gardens, made up of three main greenhouses containing thousands of species of rare plants. Open to the public all year round, it’s a great place to visit if you want to take some time out and relax right in the heart of the city. There may be endless attractions on offer in Madrid, but with a car you’ll have the chance to experience much more of Spain during your stay. 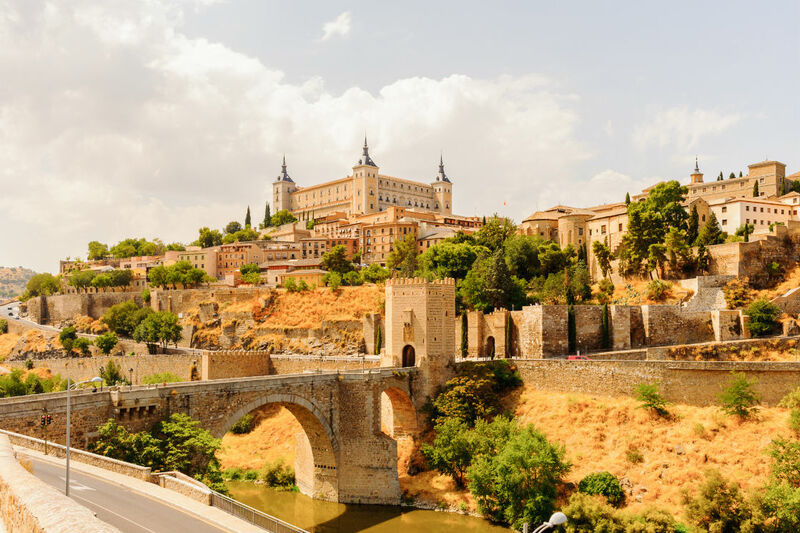 Just an hour’s drive southwest of the city is Toledo, known as the city of three cultures due to its Islamic, Hebrew and Christian influences. Once the capital of Spain, today Toledo is a much smaller city than Madrid but it’s still well worth a visit if you have time during your trip. The Old Town is a Unesco World Heritage site, featuring churches, mosques and synagogues as well as the city’s very own Puerta del Sol. One of Toledo’s most famous buildings is its cathedral, a medieval Gothic structure filled with artworks by Caravaggio, Rubens and El Greco, among others. The city is also home to a museum dedicated to El Greco, who created some of his best-known works in Toledo and died here in 1614. Another top attraction is the Alcazar, the former Roman palace that dominates the skyline perched on top of the city’s highest hill. Today it houses a huge military museum, where you can learn all about the city’s past - from Roman times all the way through to the Spanish Civil War. Many visitors to Madrid spend a day in Toledo before returning to the capital in the afternoon, but with a car you’ll have the freedom to stay a little longer. Spend some time enjoying the sunset before heading to an Old Town restaurant for some classic Spanish food. Car hire in Madrid opens up the possibility of experiencing all this and much more during your stay.